Located in Salt Lake City, Utah, ADIGMA uses custom built, data-driven paid search marketing to create an individualized toolset for businesses. The ability of ADIGMA to track and attribute both online and offline sales, down to the lowest element, creates a solution for businesses to speak to their users in a customized way. Many of their clients are franchise owners with multiple locations in different DMAs. Client Reporting and performance is 90% of the job at ADIGMA. 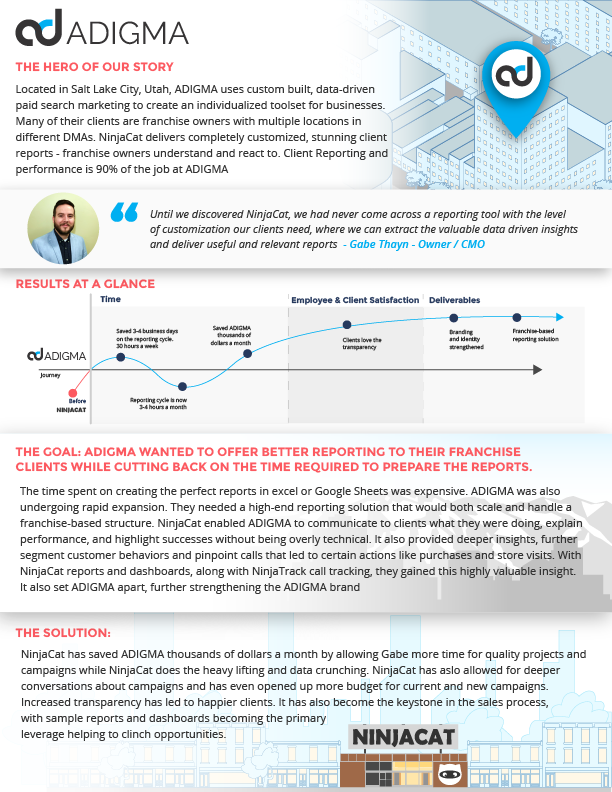 NinjaCat enables ADIGMA to deliver stunning Franchisor and Franchisee reports and interactive dashboards that the clients understand and react to. Data is not only aggregated across channels but across franchise locations, enabling roll-up reports and dashboards on Franchisor, Portfolio, Region or Franchisee performance. 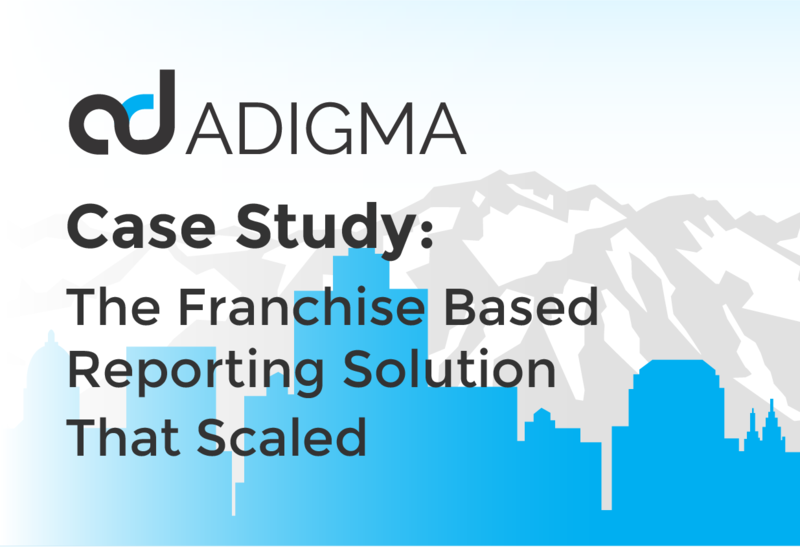 THE GOAL: ADIGMA WANTED TO OFFER BETTER REPORTING TO THEIR FRANCHISE CLIENTS WHILE CUTTING BACK ON THE TIME REQUIRED TO PREPARE THE REPORTS. Gabe is a macros samurai. The macros, formulas and customizations he had created for ADIGMA were beyond time consuming. The time spent on creating the perfect reports in excel or Google Sheets was expensive. ADIGMA was also undergoing rapid expansion. He was in need of a high-end reporting solution that would both scale and handle a franchise-based structure. It needed to include not only automation, but dashboards that matched - exactly - what Gabe had created in Excel. Precise, pixel perfect customization. Gabe had looked at several reporting solutions and noticed NinjaCat really told the story of the data. It enabled ADIGMA to communicate to clients what they were doing, explain performance, and highlight successes without being overly technical. Additionally, they wanted to be able to offer deeper insights, further segment customer behaviors and pinpoint calls that led to certain actions like purchases and store visits. With NinjaCat reports and dashboards, along with NinjaTrack call tracking, they gained this highly valuable insight. It also set ADIGMA apart, further strengthening the ADIGMA brand. The “wow” moment for ADIGMA was realizing the massive customizations, scalability and roll-up capabilities available in NinjaCat. Being a ninja himself in everything Excel, Gabe had set a high bar for his next client reporting solution. NinjaCat worked with him closely and through the on-boarding process helped him customize NinjaCat to work exactly how he needed it to work. The fact that NinjaCat could do exactly what he had setup in Excel - plus automatically incorporate data from Google Analytics, AdWords, Bing, etc. - was the driving force for Gabe and ADIGMA. NinjaCat has saved ADIGMA thousands of dollars a month by allowing Gabe more time for quality projects and campaigns while NinjaCat does the heavy lifting and data crunching. In the past they had lost clients, not because of poor performance, but because they couldn't communicate the performance in a way that made sense to clients. NinjaCat has allowed for deeper conversations about campaigns and has even opened up more budget for current and new campaigns. Increased transparency has led to happier clients. It has also become the keystone in the sales process, with sample reports and dashboards becoming the primary leverage helping to clinch opportunities. Team morale is up… who wouldn’t be happy when your brand is flourishing; current clients are happier; more prospects are interested and the competition is increasingly wary?! Are you a franchise based marketing firm who wants to take client reporting to the next level? Sign up for our quick demo and see how the NinjaCat reporting solution can enhance your business!